A short break from the Bangkok posts, here’s something closely related, yet hundreds of miles away from Thailand. 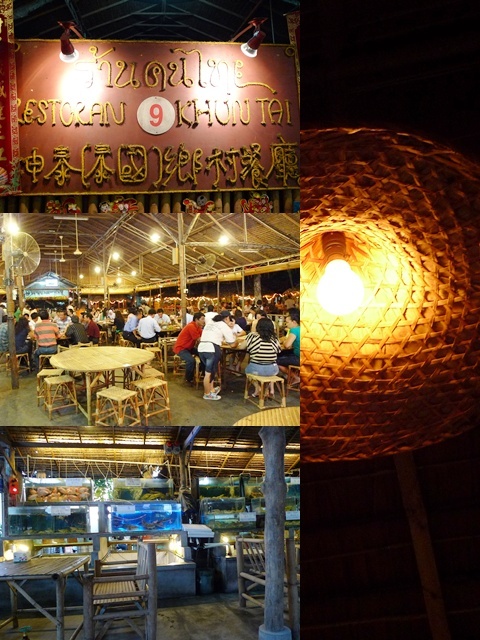 Khuntai Restaurant is indeed closer to home; A heaven for those craving for a lip-smackingly sumptuous Thai meal, with emphasis on grilled/BBQ meats and seafood, and dining al fresco style, in Butterworth, Penang. 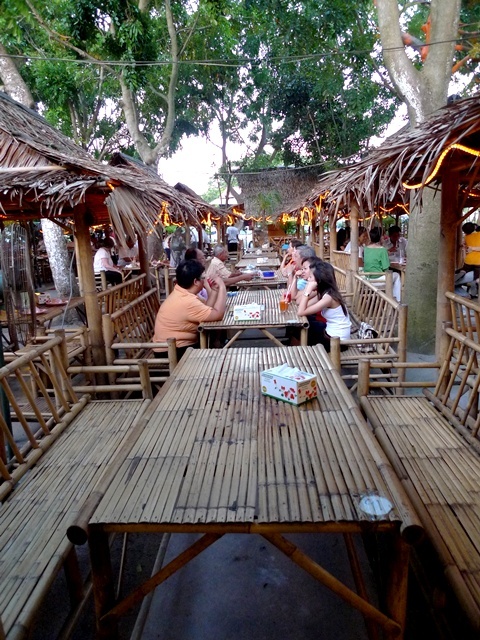 With ample seats, whether one chooses to be seated ‘indoors’ or ‘outdoors’ (under those bamboo + straw huts), dining here can be either fun and cooling, OR darn hot and infested with mosquitoes! A little long overdue, this post was supposed to see the light of day sometime ago, right after the Penang’s exodus. But somehow got suffocated in my own work, and Whoosh!!!! The month of June has come and gone in a flash. Thanks to tintin (yeah, farny name I know), a resident on mainland of Penang, we were brought to Khuntai Restaurant in Raja Uda, Butterworth, Penang. A spacious restaurant, with its own parking lot by the side (but you can actually park haphazardly anywhere at all, given the rather obscure location), this al fresco style restaurant purpotedly serves delicious yet authentic Thai food, at a fraction of the prices in higher end restaurants. 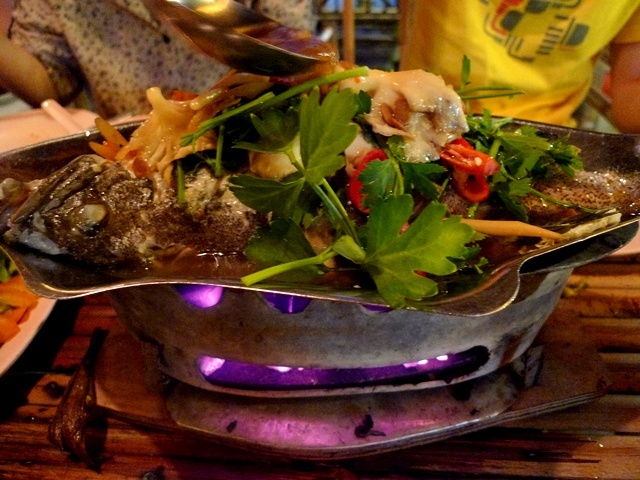 Mieng Kam, a famous appetizer – Wrap em up and pop the whole thing into your mouth! 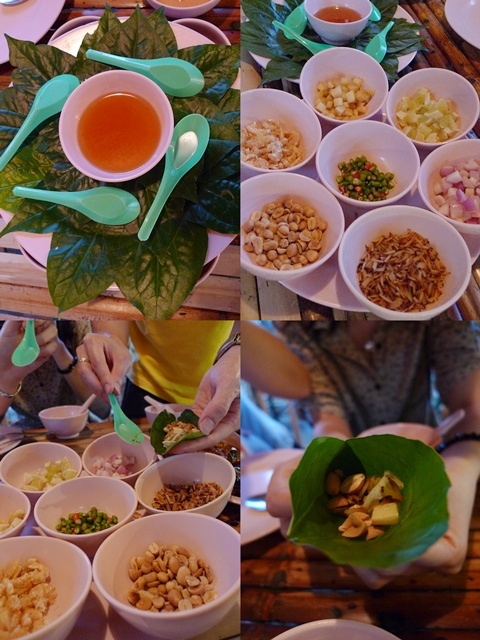 Started off withe Mieng Kam, one of my most preferred Thai appetizer, aside from the tangy mango/papaya salad. Betel leaves wrapping peanuts, dried shrimps, ginger, dried coconut flesh, bird’s eye chillies and onion. Then add a dollop of the sweetish chilli sauce, and voila! A mixture of spicy, sour, and sweet flavours bursting in one’s mouth. Unless of course, you’re not fond of the green and raw, ulam-like taste. The Tom Yum was barely torching our tongues, with heavier hints of fresh tomatoes and a generally thicker, wholesome taste with a nice touch of herbs. 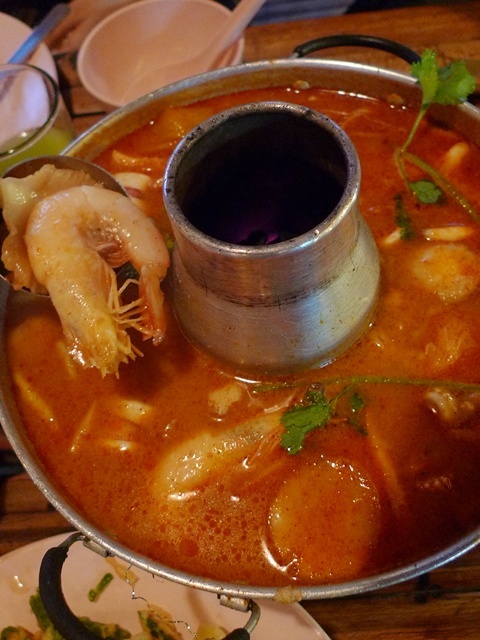 As far as Tom Yum goes in my book, this one passed the test of the palate, but without flying colours. Or probably we were expecting a lot more than this. Bouncy texture of squids, barbecued to perfection, served with two dipping sauces. One being the familiar Thai chilli sauce with crushed peanuts, and another with a distinct fiery and sour kick. Not bad, but the portion was slightly on the smaller end of the scale. Geez, my memory failed me yet again. Price-wise, and species-wise. But this should be a siakap, steamed with the signature spicy and tangy sauce, and served over the fire. Firm and tender flesh, the fish was thankfully fresh and devoid of unpleasant fishy/muddy taste. Negligible items include the fried rice with pineapples and cashew nuts, and the pandan chicken. The deep-fried kangkung (water convolvulus or morning glory) was okay, paired with sweet Thai chilli sauce, but turned soggy soon after. It is VERY dark on the outside at night, hence take note of where the other cars are heading to, and the signboard. Location : Khuntai Restaurant @ 104, Permatang Tengah, 13000 Butterworth, Penang. Opens from 11 am until 12 midnight. Tel No : +604-3327523. Here’s a Google MAP I managed to get from the internet. Sorry I can’t verify the exact location, as I am not familiar with roads in Butterworth. 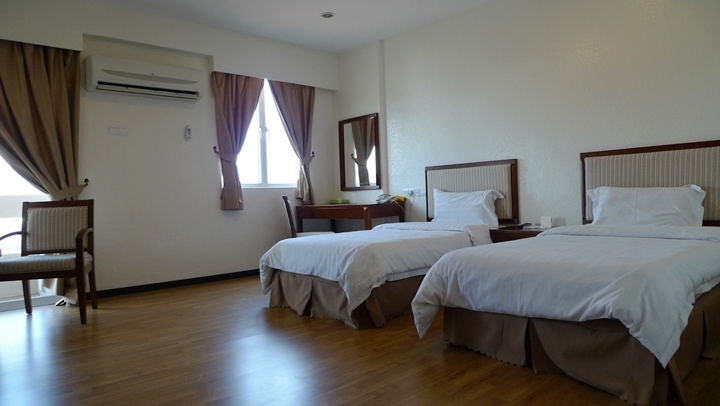 B-Suite (www) @ Bayan Lepas, Penang. Where I spent my nights …..
thai styled steamed fish is my fav….and the steamed mantis prawns and clams really mouth watering!!! the food really looks good la! Heard so much of this place but have yet to visit. The appetizer wrap looks good…get to choose and put in more of the ingredients that we like to eat. You really make me drooling! No frills??? Hello, there's nothing no-frills about this meal! Mantis prawns are FRILLS all they way!! 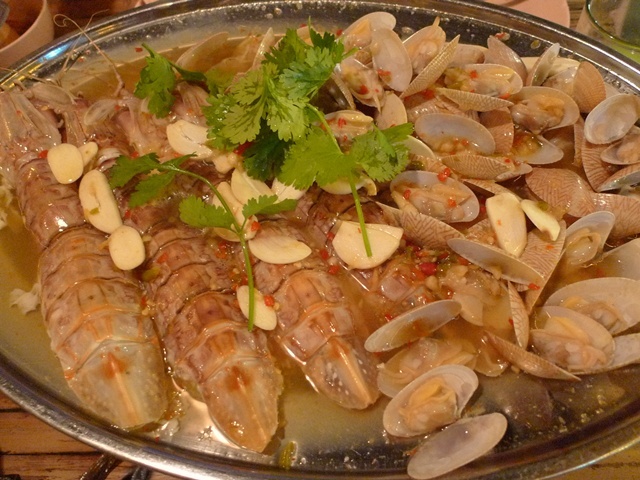 Simple Girl : yup, the Thais steam their seafood rather well. fcoe : wanna go not? YOUR penang woh … hehe, but I also dunno the way back there lah. ask tintin. ck lam : i'm sure some Thai restaurants on the island offer them? Selba : it's a rather famous appetizer. wrap them in your leaf. reana : it's raja Uda this place. dunno same ornot. but rather crowded this place. 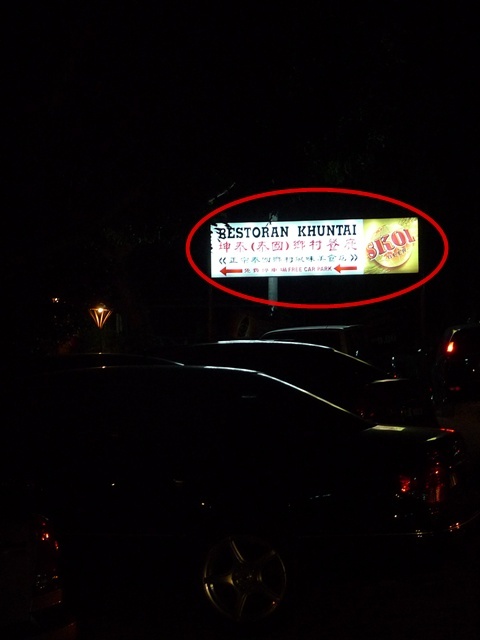 khuntai somehow sounds very familiar..i think theres another thai restaurant by that kinda name in kl..or pj..or maybe my brain is just acting up..
Good ar? This place u also know. Haha. Try their kem som fish next time. It's good. Hey Joe, you're right, I think WMW blogged about Khuntai in PJ before. 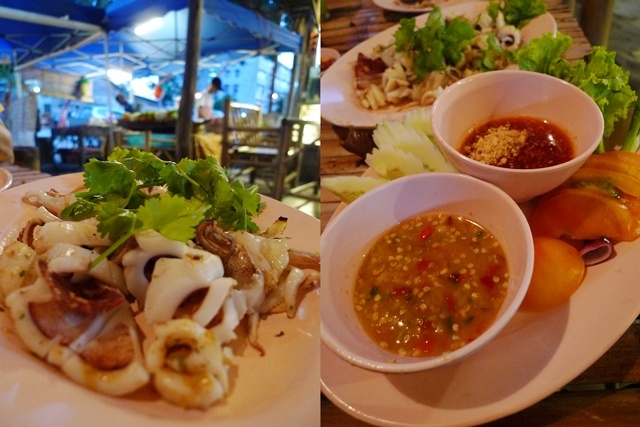 I like the spicy tomyam & BBQ squids, look so delicious! RM30 per pax is good la, for that amount of seafood. and like u said, fresh summore! but dontcha think the benches are sorta off? imagine if the person sitting in the middle wanna go pee..hehehe..
wow! this is a place I would like to be on my next trip to Penang! Just damn good! Exciting! Butterworth, big and spacious sometimes look down on by the islanders. I like the seafood. 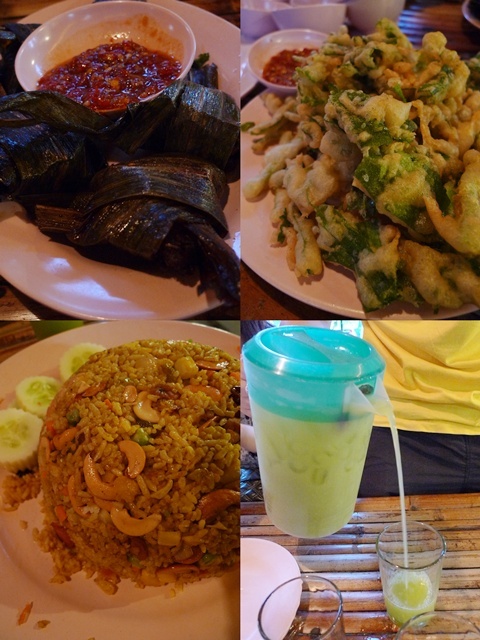 Food Paradise : Yeah, the ambience also ok. i never heard of this place, til my friend from penang brought us there. Joe : well, guess Jason cleared that up for ya! no idea if they're related or not though. soo sean : kem som fish is what? jason : thanks for the explanation. maybe the name just sticks to one's mind. KCA : yeah loh. next time we eat only prawns lah. easier…hehe… messy and yummy. Geok kee : indeed. welcome, btw. Nic : hahahaa, aiya, in the middle of the meal no pee-pee business one lah ! Elin : for us as well, that's why we seldom indulge. Haha … as if. BBO : excited now, arent we? worldwindows : if only I know my way around Butterworth/Seberang Jaya and BM. then can skip the island. but wait.. the island itself also a LOT of eateries lah! oh… too bad the tom yam is not spicy, but is it sour enuff ? One of my colleague recommended this place to me since long a ago, but yet to go, not too sure about the direction. ling239 : it's sour enough, tasty lah …not that bad. witchy : oh it's supposed to be the BEST eh? no wonder so crowded. actually i like my tom yum not fiery also, but a bit of spiciness is better than none. little inbox : i also not sure bout the directions. can refer to the google map attached, but cant verify, sorry. I've heard so much about this place but yet to go! Grrrr…. A sour and spicy soup, but not tom yam. is it this restaurant halal? Hi there Muslim Girl! Sorry for the late reply. Khuntai as far as I remember, was a pork-free restaurant. Not sure about its halal status. A Malay waitress took our order last night fyi…..
That means they’re indeed Halal?